There are no end to Christmas Trees in NYC. However only a few stand out as something beyond the ordinary. The tree at the NY Public Library on 42nd Street gives the illusion of coming across a beautiful tree in the forest just after a snowfall with all the birds taking refuge in the branches. And, the tree at the Museum of Natural History is a dedication to origami art with thousands of animals created from squares of paper. But the one that is a testament to the lasting beauty of fine art and craftsmanship is the one at the Metropolitan Museum of Art. 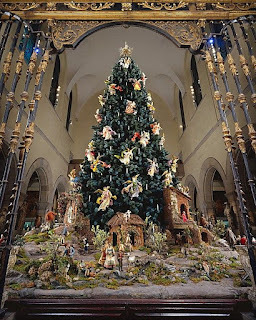 Set in the grander of the medival rooms stands an enormous tree with carved angles in its branches and the entire town of Bethlehem beneath it. Join us as we try to capture the whole tree, or just an angel, the nativity or perhaps the blacksmith working in his shop. TRANSPORTATOIN: 4, 5, 6 TO 86TH ST. Please RSVP directly to Raylie Dunkel at raylie@verizon.net. Bring a stool and dry materials to work with. We will break for lunch in the cafeteria in the building. Bring your own or purchase something there. Alexander Hamilton U.S. Custom House. Let's get one last weekend drawing in this year. 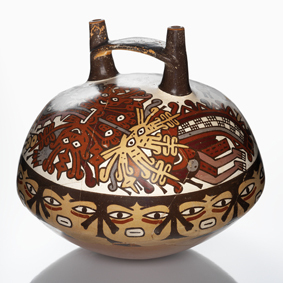 We'll sketch the museum’s permanent and temporary exhibitions—exploring the diversity of the Native people of the Americas. The building itself is a fantastic Beaux Arts structure with loads of interesting lines and perspective challenges. 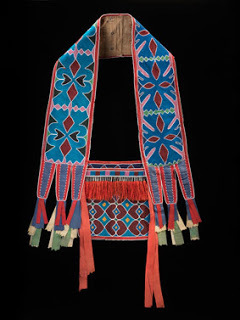 The National Museum of the American Indian–New York, is located on the south side of Bowling Green, in lower Manhattan, adjacent to the northeast corner of Battery Park. Lunch: Meet in the lobby at noon for a short walk to Flavors - 27 Whitehall St.
Show and Tell: 3:00 PM - A short walk to Murphy’s Tavern at 6 Stone St, (212) 425-1700 where we will share drawings, good stories and a snack or refreshments if you're so inclined. - Despite the metal detector I’ve brought my sketching stool with no problem. A stool is always a handy item that allows you to sketch from the very best spot. There are no fees. All drawing skill levels are welcome. There will be no planned sketch event for this coming weekend. However time spent with family and friends is always made more memorable by sketching. 'Tis the season, and New York does it better than most places. The lights and decorations around the city are magnificent. However, most are outdoors and sketching them would certainly be uncomfortable. 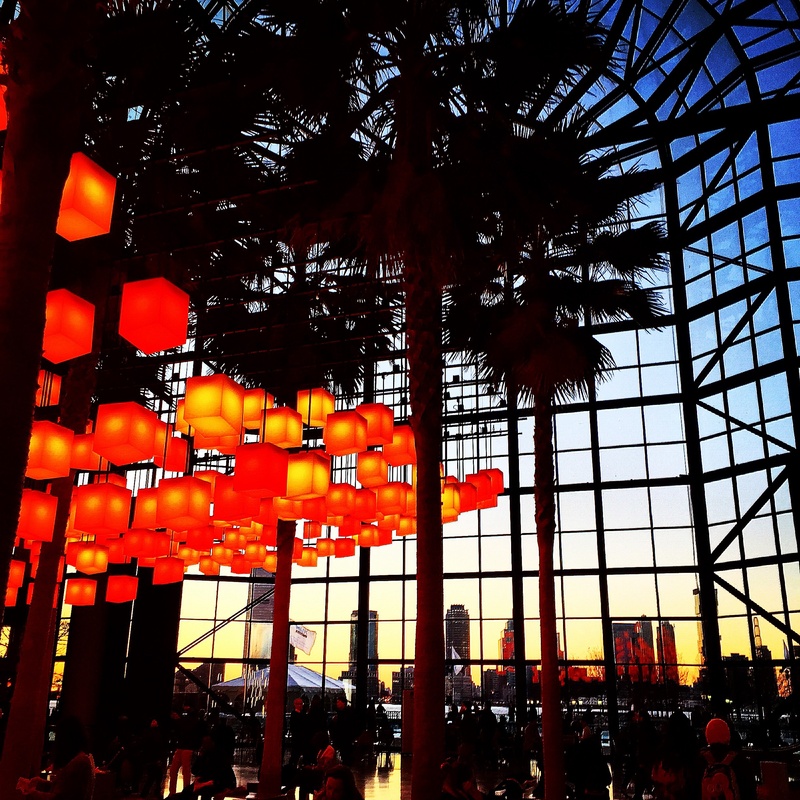 However, there is at least one place that has beautiful, unique holiday lights that are indoors: The World Financial Center Palm Court (also known as Brookfield Place). The Luminaries have been hung again for the holiday season. 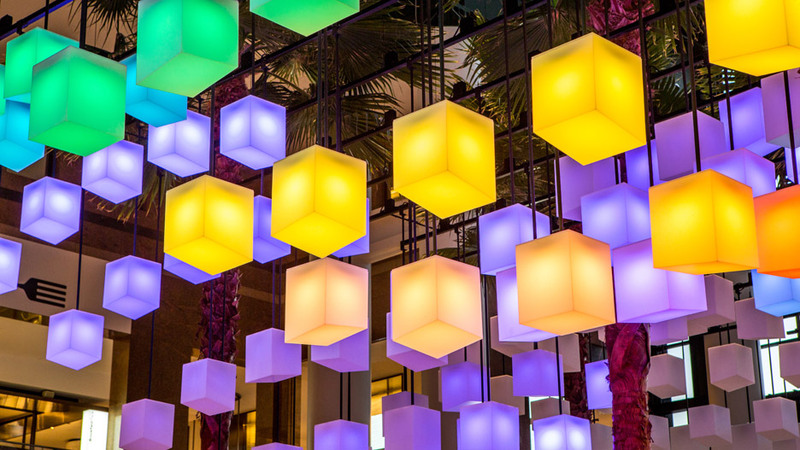 Beautiful strings of lit boxes that change color as you watch them. (Perfect for watercolor washes!). Not only can you watch them but you can control the changes in color! Please RSVP directly to Raylie Dunkel at raylie@verizon.net. Looking for us? Call Raylie at 201-9789-6387. No need to bring a stool as there are lots of chairs. Bring your lunch or purchase something at Hudson Eats. NOTE: Of all the challenges of living in NYC, there is one unique to Urban Sketchers: too many things to sketch, especially around the Holidays. So to make sure we get to do as much as possible there will be a small change to the printed schedule. 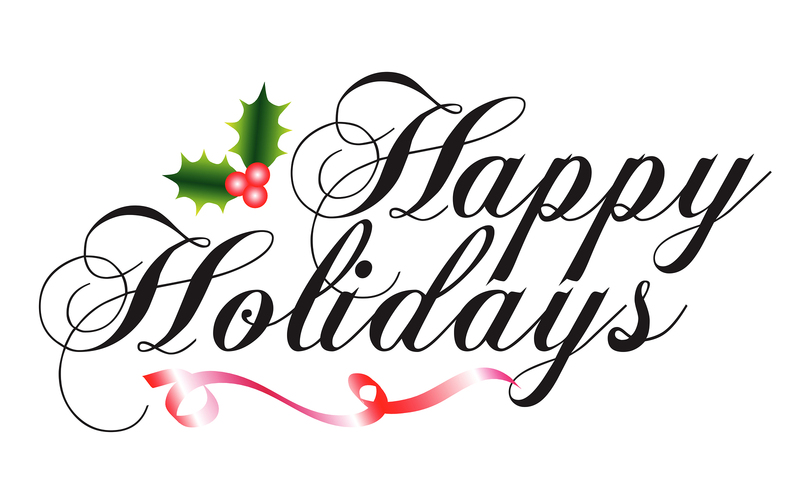 The January 4th meeting will be held at the Metropolitan Museum so that we can sketch the magnificent Christmas Tree. Therefore there will be an optional afternoon sketching event this week, after we sketch the luminaries, to see and sketch the exhibit at the Fashion Institute of Technology, "Expedition: Fashion from the Extreme, which will be closing on January 6th"
After sketching in Times Square and then at Rockerfeller Center, both incredible but hectic locations, maybe like me, your spirit is crying out for artistic tranquility. 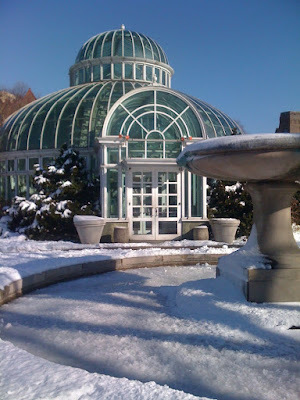 In thinking of the peaceful soul nurturing locations in New York City, (and there are many) the one that feels like it will be most satisfying is a visit to Brooklyn’s Botanic Gardens. I hope you will join us on Sunday. Our focus will be the Hot House complex with it’s fascinating rooms capturing different seasons and various climates. It’s a chance to be in nature sketching without a jacket in December. The Gardens Open at 10 AM. Our base of operations will be the Conservatory, whose indoor attractions include the Aquatic House, the Bonsai Museum, the Desert and Tropical Pavilions and the Warm Temperate Pavilion. The winter light should be beautiful including the possibility of outdoor sketching, weather permitting. When and Where 10 AM at the Steinhardt Conservatory (the hot house complex) in the Brooklyn Botanic Gardens. We’ll meet on the first floor near the main entrance and will then fan out from there. - By Car - There's convenient parking behind the Brooklyn Museum which is adjacent to the Gardens. Lunch: 12:00 Noon at the Yellow Magnolia Café (in the Garden a short walk from the Hot House) a healthy restaurant offering vegan, vegetarian, and gluten-free options. Show and Tell: 3:00 PM walk to Tooker Alley, 793 Washington Ave, 347) 955-4743 to share drawings, good stories and a beer or wine if you're so inclined. - Easels and tripods are not permitted. - Stools are generally not a problem and make sketching easier. 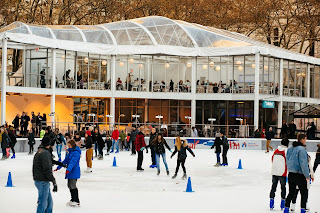 We love sketching in Bryant Park, especially in the winter when there is a holiday market and the skating rink is set up! Too cold to work outdoors? No problem. There is an indoor observation area one level up above the skating rink. Bring your watercolors and be ready to capture the color and the action that is part of winter in NYC! 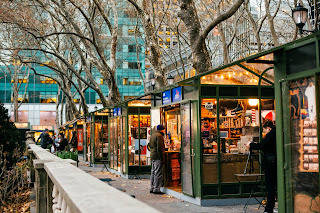 LOCATION: BRYANT PARK, 6th Ave and 42nd St. Note: we will meet in the seating area on the east side of the skating rink towards the library. If it is very cold we will meet in the observation area on the south side of the rink. TRANSPORTATION: B, D, F, M to 42nd St/Bryant Park, 7 to 5th Ave. Please RSVP directly to Raylie Dunkel at raylie@verizon.net. No need to bring a stool...lots of chairs around the rink. We will break for lunch about 12:30 and go indoors at Whole Foods on 6th Ave. 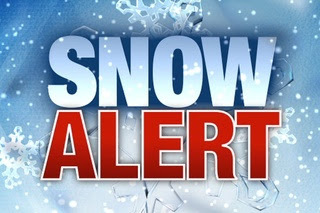 The forecast for tomorrow is 100% chance for snow ranging from 3 - 5 inches. The Noguchi Museum will require a very long walk and will be unsuitable for tomorrow’s sketch. We will definitley visit this lovely museum another time. The good news is that NYC has so many wonderful locations. at the World Trade Center. 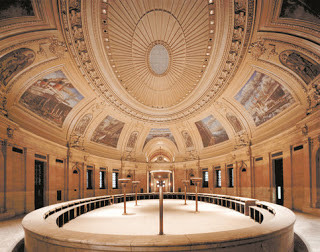 It is one of the most stunning interior spaces in NYC. It’s got people, perspective, loads of shops and a warm interior. Because of the locations history it is a heavily secured area and we will need to be respectful. 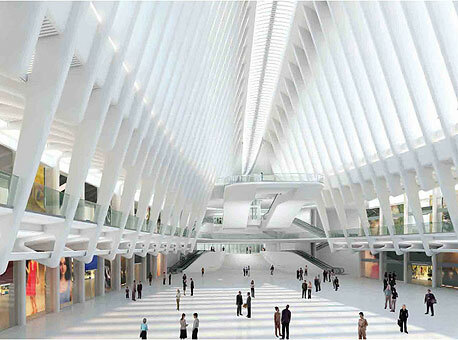 When and Where: We will meet at the eastern end of the Oculus. The space is a long tube that connects the Fulton Street subway stops with the World Financial Center. Following that east to west path you come to a balcony with an incredible view of the Oculus space below. That’s where we will meet at 11 AM. Lunch: 12:30 at the Winter Garden Food Court. Afternoon: 1:30 back to drawing the interior. Show and Tell: 3:00 PM. Details to be announced - this is the social part of our sketch day - our time to share drawings, good stories and get a snack or a drink if you're so inclined. Our visit to the museum was suggested by NYC Urban Sketcher Nobuko Kobayashi. Many thanks! 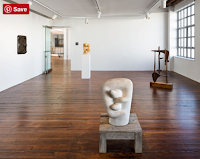 The museum was founded and designed by internationally-renowned American artist Isamu Noguchi. 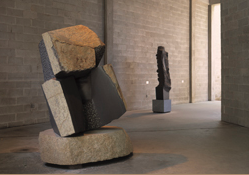 It features indoor-outdoor galleries and a serene outdoor sculpture garden. I love this quiet lovely museum because his modern sculptures and unique shaped gallery space. Opened in 1985, the Museum complex was built around a 1920s industrial building, and features indoor-outdoor galleries and a serene outdoor sculpture garden, with two floors of interior exhibition space. 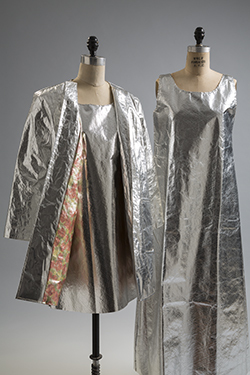 Located in the vibrant neighborhood of Long Island City, Queens, the Museum is itself considered to be one of the artist’s greatest achievements. In building a museum, Noguchi was an early pioneer who led the metamorphosis of the Long Island City area into the arts district it is today. Lunch: 12:30 PM - There are no lunch spots nearby. Best bet is to bring food or purchase something on your way. We can eat in their garden or across the street on Socrates Park. Afternoon: 1:30 PM - Back sketching the Noguchi. 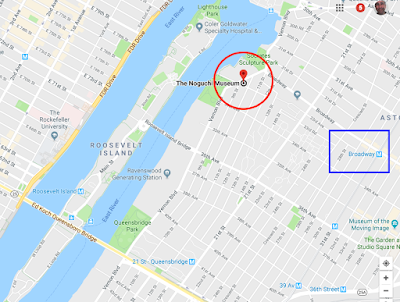 Show and Tell: 3:00 PM We’ll walk several blocks to The Strand, 25-27 Broadway, Astoria, (718) 440-3231, a super Barbecue spot that serves drinks and other eatable where we will share our drawings, good stories and a snack, beer or wine if you're so inclined. - No wet medium in this location. we can only use dry mediums. I've had mixed results using a waterbrush in these situations. Often the issue is not having an open water container. - The website said we can't use a tripod for camera, so we probably can't use easels. The Cloisters is wonderful at any time of year, but especially so during the holiday season with the sumptuous decorations throughout the building and grounds. 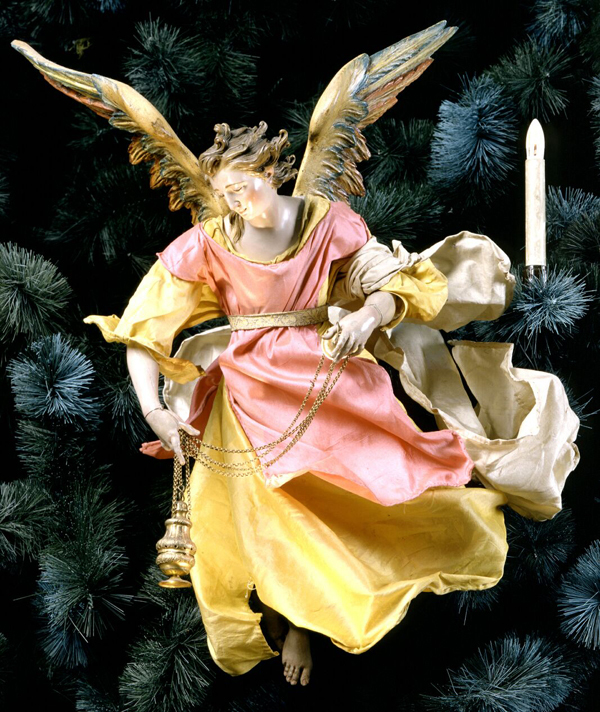 Much of the iconography of Christmas is based in European art and architecture. 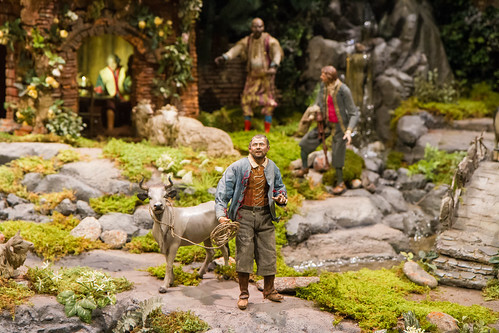 A subway ride to the Cloisters is an easy alternative for experiencing the sculpture, tapestries, and buildings that are the basis for the books, greeting cards and religious displays that we prize during this season. Here is a clip see how they do it! We will meet in the entrance hall by the information booth. You can bring a stool. Remember that only pencil is allowed in the galleries. No wet medium. There is an entrance fee for the museum. A Met Museum membership or City Pass will gain you entrance. 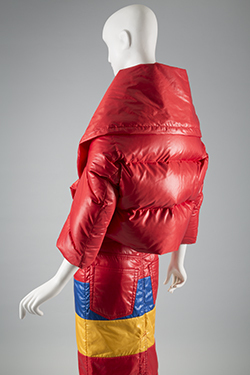 The museum's policy is "pay what you want" so if you are not a member any modest amount will be accepted. TRANSPORTATION: A Train to 190 St Station. Take elevators to the street level and walk along Margaret Corbin Drive for about 10 minutes to the museum. Or transfer to the M4 bus for one stop to the museum. 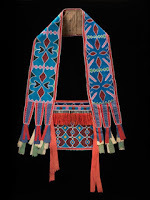 If you are driving, please check directions at the Met Museum web site. There is free parking available at the museum. Please RSVP directly to Raylie Dunkel at raylie@verizon.net. Looking for us? Call/Text Raylie at 201-979-6387. This is a message to Urban Sketchers and those interested in the underbelly of New York City history: RUN DON’T WALK to the exhibit currently at the Anya and Andrew Shiva Gallery at John Jay College of Criminal Justice until February 2, 2018. 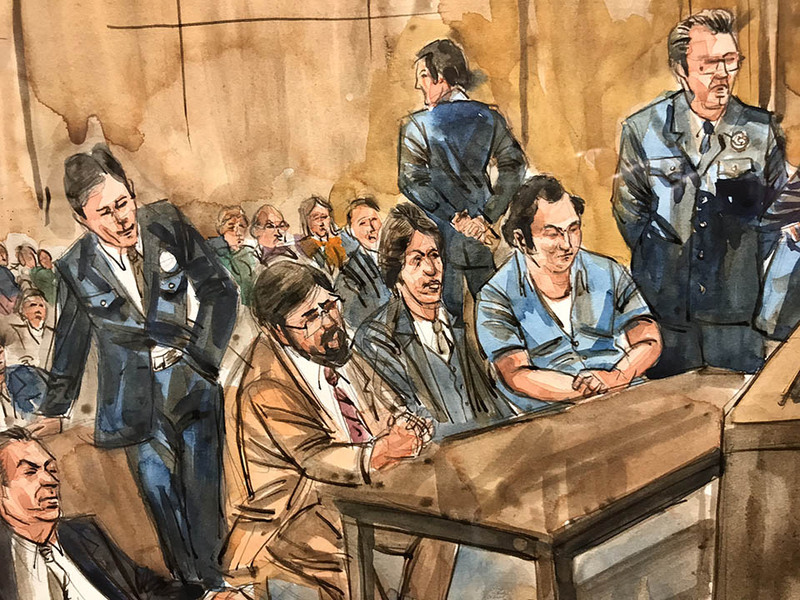 The show is entitled Rogues Gallery: Forty Year Retrospective of Courtroom Art from Son of Sam to El Chapo. For sketch enthusiasts and tabloid fans, this is a bonanza of faces and techniques executed on the spot in courtrooms where cameras are prohibited. 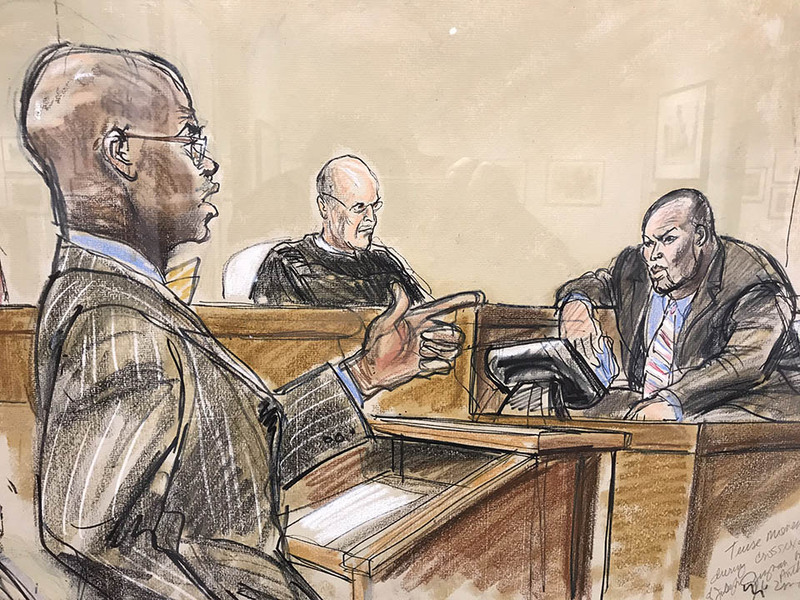 There are 78 large-scale sketches by three professional courtroom artists: Richard Tomlinson, Aggie Whelan Kenney, and Elizabeth Williams. The amazing skill of these artists, and expressiveness of the sketches is totally enjoyable to see up close and learn from. Techniques include watercolor, gouache, pen and ink, pastel, charcoal, and markers. There is a free catalog with bios of the artists and background info on each sensational trial sketched. 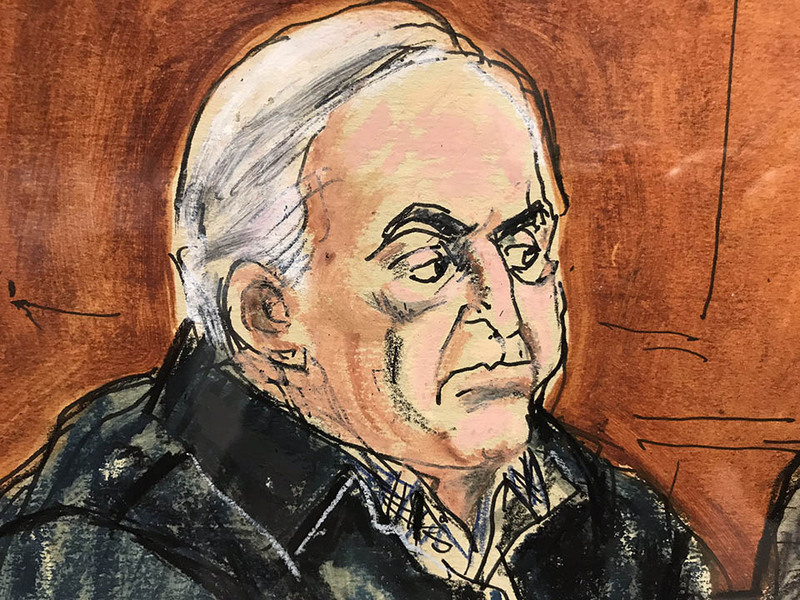 The people on trial include a true rogue’s gallery of New Yorkers involved in all sorts of mayhem including murder, fraud, terrorism, assault, extortion, and white collar crime. They include Son of Sam David Berkowitz, Robert Chambers, John Gotti, Bernie Madoff, Martha Stuart, Mark David Chapman, Leona Helmsley, and others. 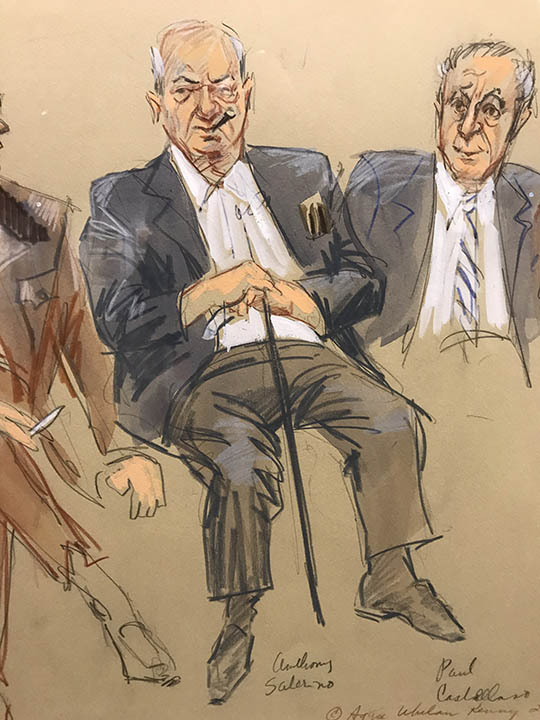 Witnesses in the courtroom include Michael Bloomberg, Mick Jagger, Woody Allen, Ed Koch, Donald Trump, and Al Sharpton. The sketches brought back memories of a City that once was. 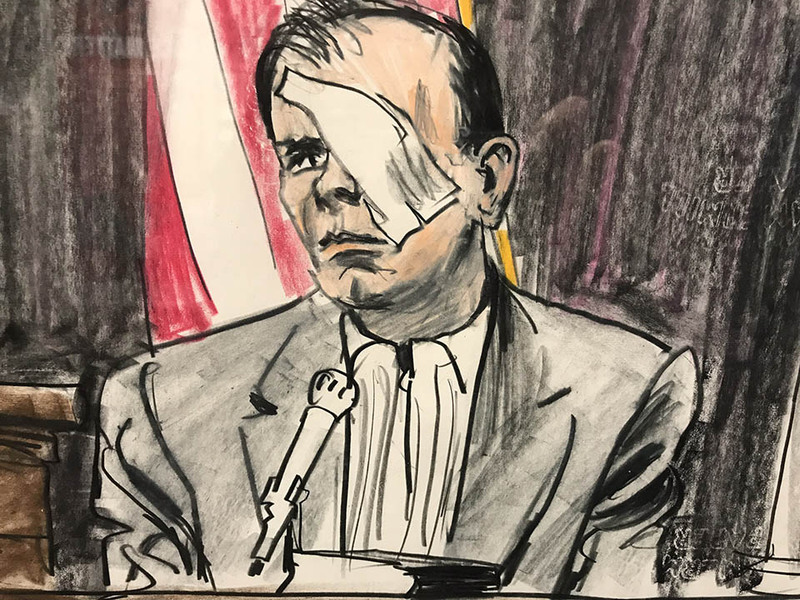 A typical example is the trial of Bernhard Goetz, who shot four black teenagers with an unlicensed handgun in the subway. 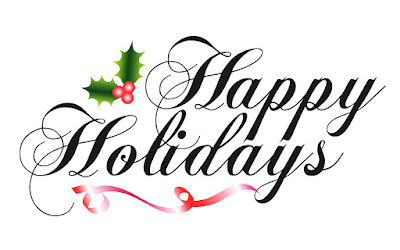 It was December 1984 – the year I moved from Orange, New Jersey into my brownstone walk-up on West 90th street. 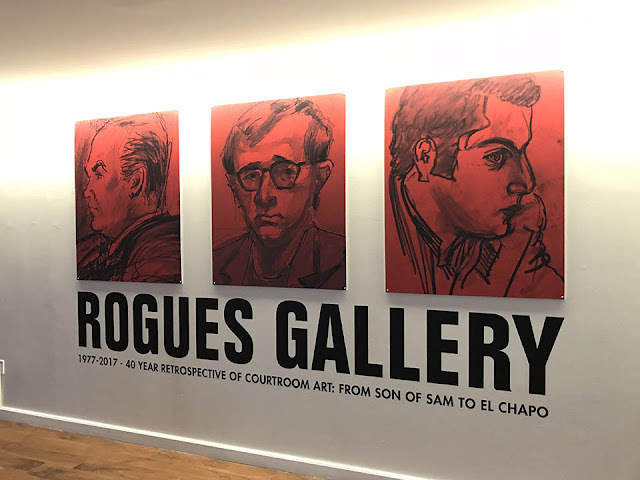 Rogues Gallery runs until February 2, 2018 and is free. 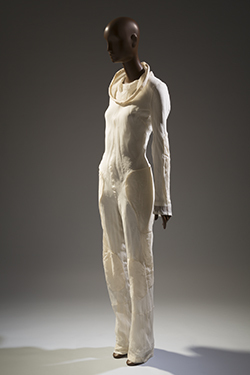 The gallery is located on 524 West 59th Street near 11th Avenue, and is open to the public Monday – Friday, 1-5 PM. Sketchers, don’t miss this one!